Buffets, roulette wheels, buffets, magicians, more buffets. Ok, Las Vegas has a little something for everyone! But… maybe not for the real estate investor. 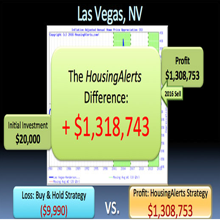 You probably know someone who has bought in Vegas or at least considered investing there, maybe even you have. Well, what you’re about to read is going to challenge how you view real estate investing, so hang on tight and pay close attention. Let’s start by taking an aerial view of the world of real estate prices in Las Vegas. Wow, did you see this? A 35-year buy and hold strategy and you still lose $9,990! If that doesn’t stop you dead in your tracks, I don’t know what will! 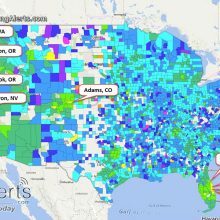 This chart is similar to others we’ve seen, except it covers only the Las Vegas market, not the entire U.S. I mean – it’s similar in that it shows annual home price appreciation or decline, but as you can see, it looks very different from any of the others. In fact, Las Vegas is an extreme and rare example – it’s as flat as any market I’ve ever seen. See how for all of the 1980’s and 90’s it just hugged the break-even line… little tiny mini-cycles of plus or minus a few percent? This market had no momentum whatsoever. It was basically only good for ‘scalping’ – using Transactional Income strategies like wholesaling, lease-options – or maybe even rehabbing – to squeeze out a few bucks on each transaction… but virtually NO opportunity for creating real Generational Wealth except for that period where you see the blue line shooting up. I’ve done more than my share of transactional income deals over the last 35 years… let me tell you – that ain’t how wealth is created! It’s like a job, only with more work, more risk and more stress – ESPECIALLY in a flat or dead market. I’m not knocking those Transactional strategies – unless you’re doing them blindfolded to the market… NO strategy is going to work if you’re fighting against the market. 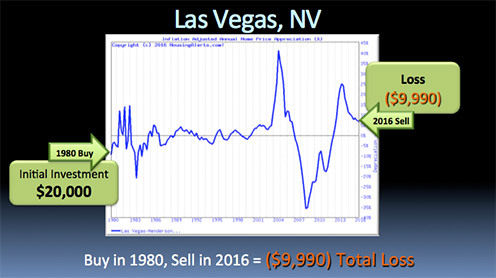 If you invested in Las Vegas at ANYTIME in the last 35 years, and you still own it today… you lost money… home values in Las Vegas have not even kept up with inflation! Let’s assume you had $20,000 to invest back in 1980. You’ll used that as your down payment, got an interest only mortgage loan for, say 85% LTV (Loan to Value) and bought a house. For simplicity, we’ll assume rents = your carrying costs like interest, taxes, insurance, maintenance, etc. Now, in mid 2016, you sell it at full market value, which, unfortunately, is $9,990 LESS than what you paid for it, after adjusting for inflation. Your original $20,000 down payment? – GONE. You’d have to come out of pocket another $10,010 at closing just to pay off your mortgage, add on top of that all your transaction costs & Realtor® fees… all that time, money and effort – down the drain. That’s the dirty little truth about real estate – lots of people quietly LOSE money year after year – you only hear about the winners. It gets much uglier if you bought it during the boom times, or even as a bottom fisher in the last couple years. 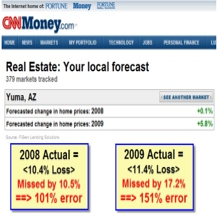 I had tons of people telling me I was wrong – BACK IN 2007 – that the Las Vegas market had already bottomed – after that spectacular crash. Then THOSE investors soon found themselves underwater. …and a fresh crop of bottom fishers showed up the next year, in 2008 – now THEY’re underwater too. Same for the 2009 crop… betting the farm once again that the Vegas market had bottomed. Folks, DO NOT guess at this stuff. I mean, sooner or later, even a broken clock is right twice a day – but why gamble the farm on speculation? If you’re wrong, it’s game over for you. Regardless of when you bought over the last 35 years – it’s a hell of a thought to have dealt with tenants and toilets for that many years, and lost money in the process… just because you didn’t pay attention to the main driver of success: The Market. That sad story is being repeated millions of times across the country right now… same as it was during the last down cycle… and the same as it will be in the next cycle, unless you learn how to do it like the pros. Why not get it right the first time and avoid all that pain? I’ll show you EXACTLY how to get it right the first time.